You can view all the Iridium GO! Prepaid & Monthly Airtime Plans listed here below in detail, and select the one you like by hitting the view button, or you can just select the image below in which one is for Prepaid and one for Monthly. Our bundled prepaid airtime plans combine all the usual monthly service rates, with a bundle of voice & data airtime that make the prepaid option for the Iridium GO a great way to save money without the need for monthly service agreements or contracts. 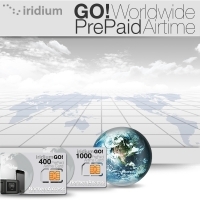 All the iridium Go prepaid plans, such as the 400 data minute prepaid card also give you the option of using it for voice calls as well. So on the chart below it will show 400 data minute, and 200 voice minutes. This means that you can use either 400 minutes of data, or 200 minutes of voice, or combine the two of them and let the iridium GO prepaid card system do the math for you. You do not get both 400 data minutes and 200 voice minutes combined. When using voice minutes it is billed at double the cost of data, which in this example card shows how the starting 400 minutes would be equal to 200 minutes of voice. Talk to us with any questions on this. Minutes can be used for Voice, Data, Text or in combination. 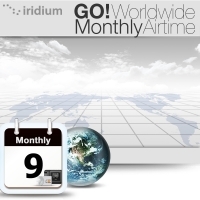 Our monthly iridium Go plans, are great for those that just want to pay a low monthly rate, and pay as you go, or get the new Unlimited Data plan that gives you a limitless amount of data on the Iridium GO certified Applications only. The Monthly plans are also good for those that want or need monthly statements that breakdown all airtime use, and monthly service fees, such as businesses, or government that need these formal records. *All New Accounts require a $30.00 Activation Fee.